Wales remained on course to end a 27-year wait for a Grand Slam after a record 46-22 win over Scotland at Murrayfield in March 2005. 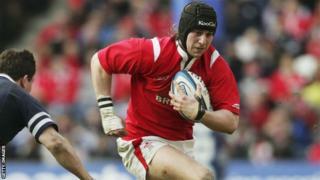 Mike Ruddock's side wrapped up their fourth win of the 2005 Six Nations campaign in a sensational opening 40 minutes. Tries from Ryan Jones, Rhys Williams, Shane Williams and two from Kevin Morgan gave Wales a 38-3 interval lead. Rhys Williams added a second after the break, before Andy Craig, Rory Lamont and Chris Paterson scored consolation tries for Scotland.